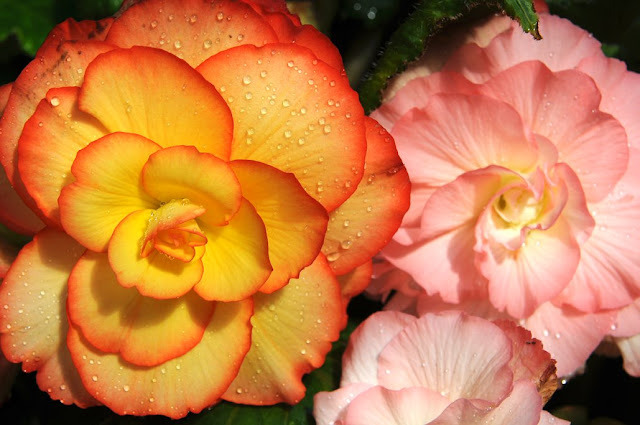 This year I made a significant investment in growing Tuberous Begonias. Two years ago, while attending the Chealsea Flower Show, I saw an amazing display of giant Tuberous Begonias grown by the prestigious British firm Blackmore & Langdon. I was familiar with the firm, mostly for their award winning displays and strains of Delphinium- they are the world's premiere grower, and if you don't believe me, just Google B&L Delphiniums, and make sure you are seated. 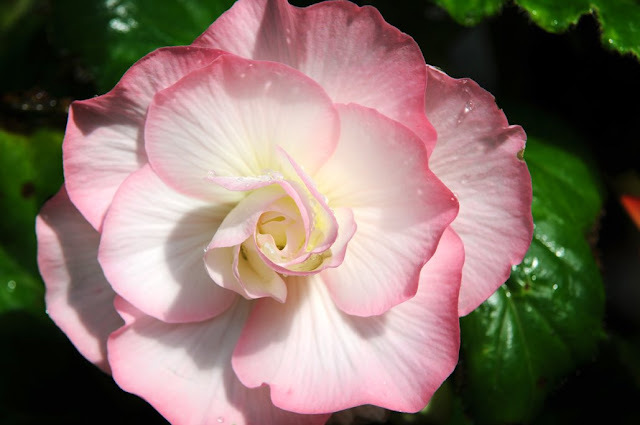 I noticed a few years ago that Blackmore & Langdon Tuberous Begonias were being carried in a partnership through the US firm, White FLower Farm, but some bulbs (tubers) were selling for $60 and $75 dollars US, with one variety selling for an astonishing $125! Upon visiting White Flower Farm the following summer, I entered one of their greenhouses and instantly I could see why these plants were so expensive. All I could say is wow. 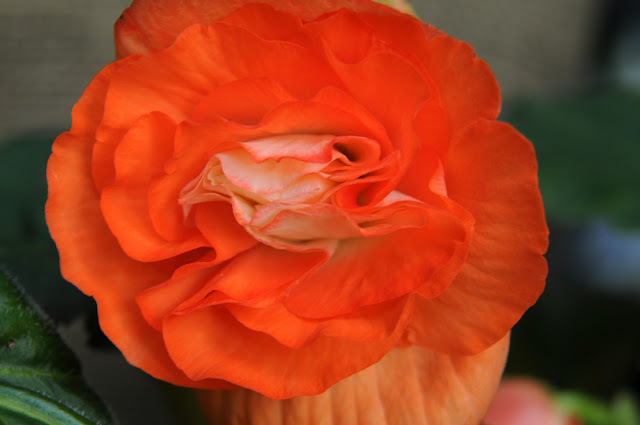 Still, $125 for a tuberous begonia is far too steep for even me. My solution? 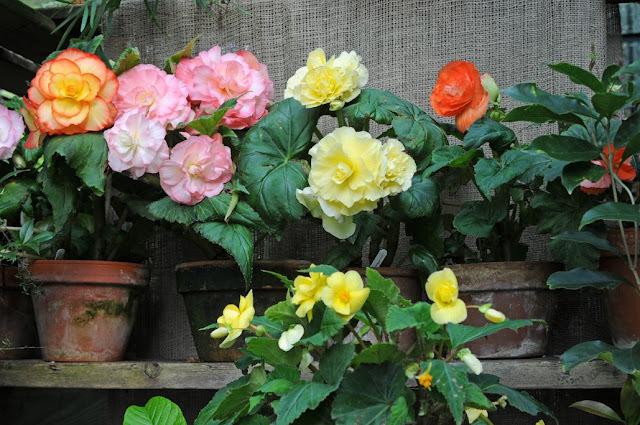 I order my B&L Exhibition begonias direct from England, from the Blackmore and Langdon website. 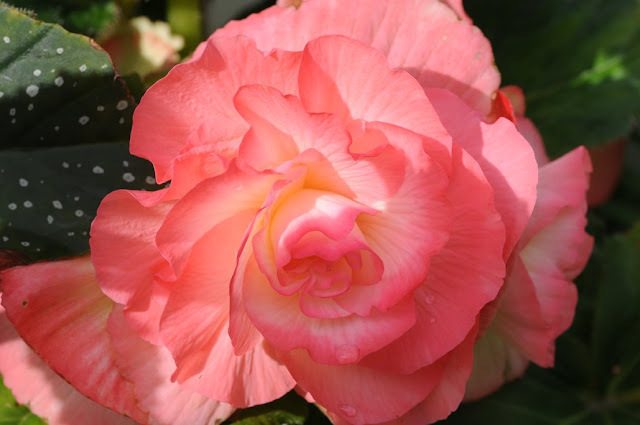 Here is a link - B&L nursery - founded in 1910, they are the world's finest grower of award winning Tuberous Begonias and Delphinium, and they have been for nearly 120 years. These tubers can retail for up to $125. each in the US, but can be ordered direct from B&L for a third of the cost. 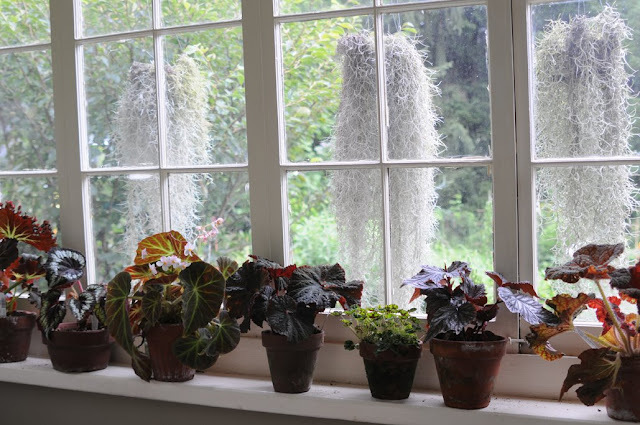 One cannot compare these plants with the inexpensive weak strains of tuberous begonias one finds in peat-filled poly bags at garden centers in the spring. If you can afford one, try one of these next year. These tubers are all about pedigree and provenance, and with hardly anyone breeding new varieties today, B& L is one of the last places on earth to find the choice, exhibition strains. 'pretty' in the world of flowers, has to try a little harder. An seedling or un named variety, from B&L, available for even less than $15.00. Still, just as beautiful, isn't it? Sometimes, paying $30 to $74 for an exhibition quality variety is not necessary. Another of the B&L un-named seedling bulbs. A beautiful pink shade. 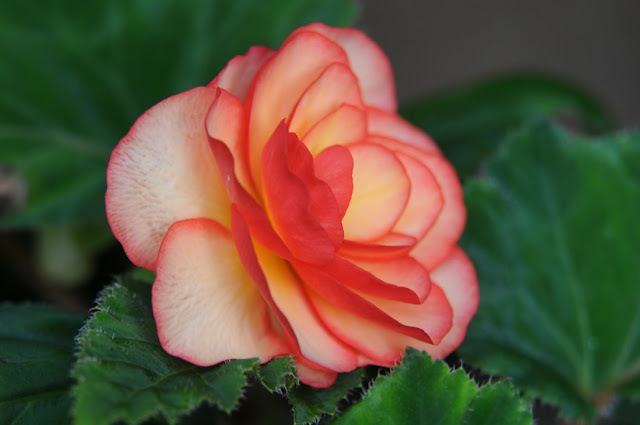 It may seem as if White Flower Farm is over charging those of us in the US for B&L tuberous begonia tubers, but one must understand their pedigree, as well as the cost of importing these finest of the finest begonia tubers. If you have any question regarding their value, then I urge you to visit White Flower Farm during the summer and see these plants for yourself. Or better yet, do what I did and order a few of these incredible varieties for your self to grow. 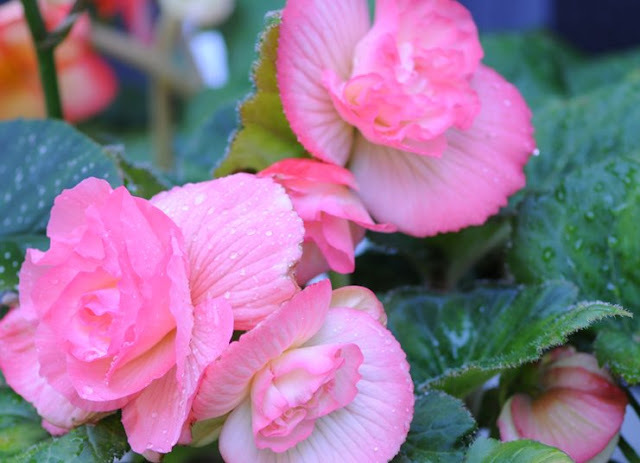 B&L Begonias are not inexpensive but they will outshine any Dutch grown tuber if you buy those bagged varieteis in the spring from the big box stores, or from a value mail order source. You get what you pay for when it comes to most plants. But if you are looking for value, I suggest ordering the B&L seedling tubers, which sell for much less, around $15. per tuber. But order in January, for they sell out quickly. Even I, who often thinks little about dropping $75. 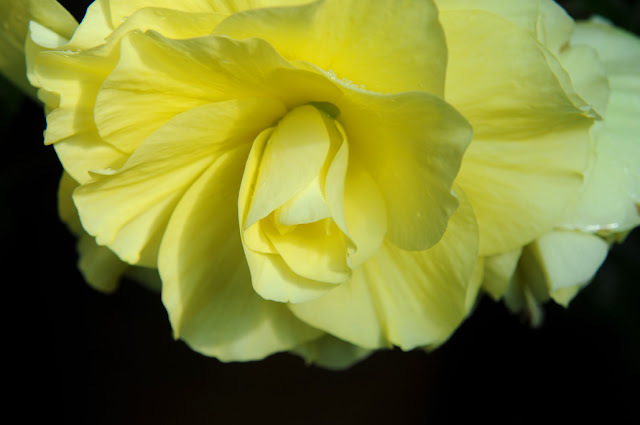 for a rare South African Bulb, shrieks at the thought of a Tuberous Begonia selling for $80. Let alone $125.. I agree that ordering from the White Flower Farm catalog might not as be as cost efficient as ordering direct from England, but it is easier, and if you are only planning on ordering a couple of tubers, the shipping cost alone from the UK makes White Flower Farm a more economical source. Un-named Picotee variety from the more inexpensive mixed selections from B&L in England. Each year, I order direct, from Blackmore & Langdon in the UK, and each year I am impressed with the results. It works out well for me, as I generally order about 25 tubers, so the shipping cost makes sense. 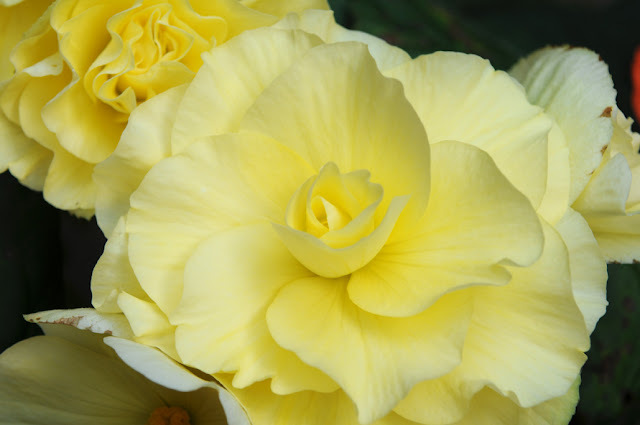 Arguably, paying $35.00 US for a Tuberous Begonia is still a luxury for most people but as there are no longer any breeders selling US grown bulbs, there are few choices. My Tuberous Begonia project had me growing nearly 50 varieties, which I ordered in January, and started under lights indoors in February. A few reminders about ordering from B&L. 1. Order early, most varieties sell out by December. 2. Try the unknamed seedlings, many of these are equally as stunning, and if you are not going to exhibit them, why not. Make up a name for your friends. I'm thinking of some of the unknamed pinks as, 'Paris Hilton', or a yellow as 'Legally Blonde'. 3. Don't give up on White Flower Farm, commercial? Sure, but I would imagine that they tubers they carry are prob. the premium size, and if you can afford them, they are the only source in the US. Other Begonia species and various fiberous forms, spending the summer on the back porch. 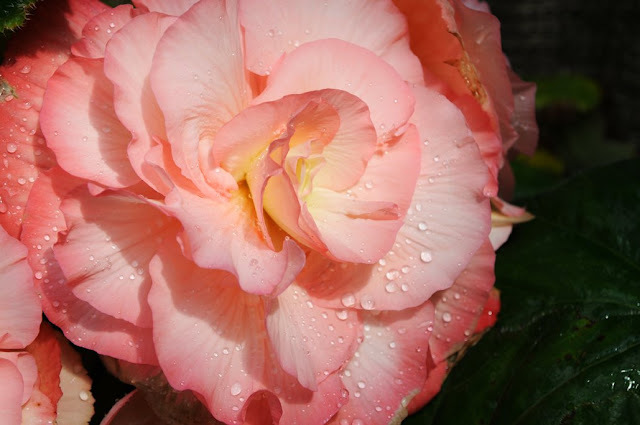 Late summer is when most Begonia's start to really shine. Overall, I have been happy with these given that this year was terribly rainy, and I had kept them plants on the deck too long, and they started to rot the foliage a bit. 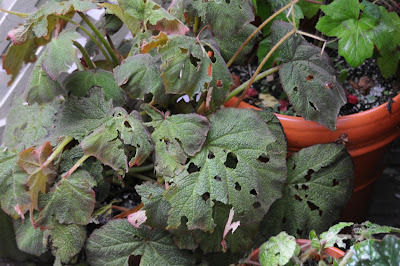 June and early July was too hot to keep them in the greenhouse, but I have found that most of my Begonias like to spend the summer on the back porch, where they can dry out a bit between waterings, and not get rained on. The greenhouse, even with shade cloth, does get too hot in July. 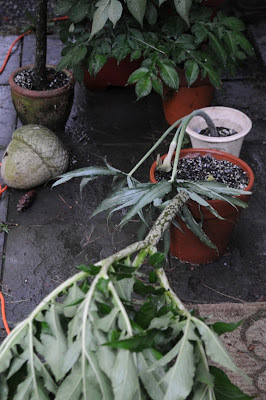 By August, I move most plants back into the greenhouse, since cooler evenings start to arrive around the third week. It was 45 deg. F here Monday night, but 90 degrees F today. 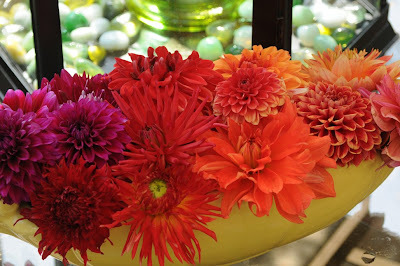 August isn't August, without Dahlias, and Dhucks. A rainbow of Dahlias - the first picking of a carefully selected color palette that I ordered on-line hoping to get the perfect spectrum of tints in the maroon, red-purple shades. I love them, and the orange tones balance it out well. 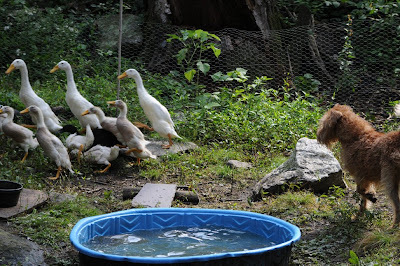 The Indian Runner ducks are growing FAST. 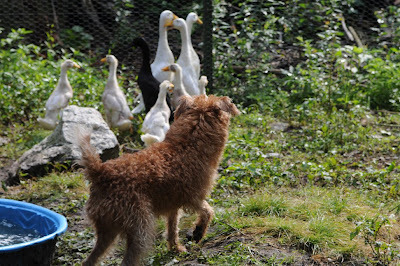 And Margaret loves keeping them in order. The only problem is, they don;t like her for some reason. With all of the crazy weather that we have been getting here in Eastern US in New England this summer, it was bound to happen, and yesterday, it did. Hail. Yesterday, we finally recieved our share of hail, delivered in a particularly strong cell in our daily bombardment of thunderstorms, a weather pattern that seems to never go away this year. 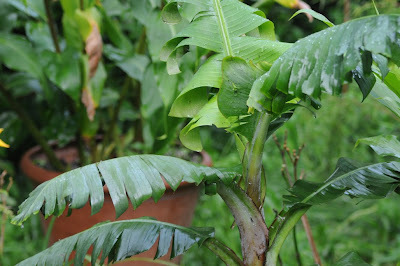 Most vulnerable, naturally, are the larger-leaved plants with tender leaves,especially the tropicals, be it begonias, bananas or the Alocasia or Colocasia clan of those plants most people know as 'Elephant ears'. Now, they are pierced, elephant ears. 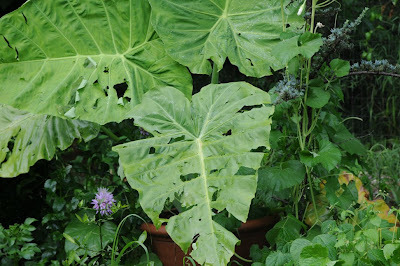 Two minutes of pelting ice cubes the size of nickles is all it takes to shred these leaves into an arum-esque chiffonade. 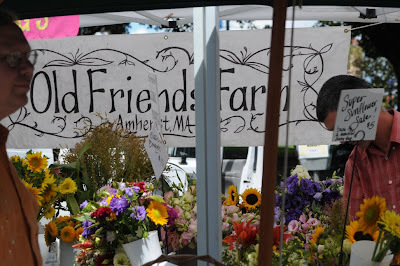 The Organic Farmers Market on the common at Amherst, Massachusetts was a surprise find for us, this past Saturday. 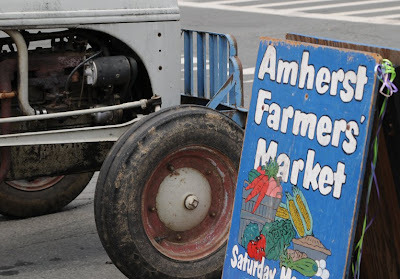 It may become a weekly summer event ( and an autumn one, too) since we rarely get out of the house now, and Amherst is located on a very pleasing one hour drive, west of here. Ameherst, a lovely tiny college town in the foot hills of the Berkshires ( or, more accurately, in Pioneer Valley) is famous for Amherst College, a small, private Ivy covered college which takes up much of the small town, and which makes the town more like Cambridge and Harvard in feeling and atmosphere. I know that this will become a favorite destination, for not only does the town offer other day-drive treats such as some of our favorite tyles of small restaurants like Indian, noodle shops and used book stores, it also is my alma mater, so I love visiting and renewing memories of my college years. 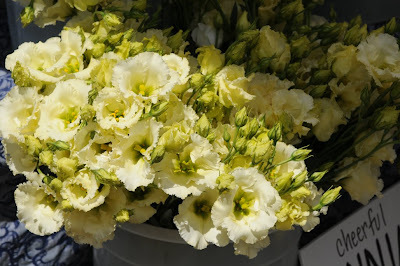 Heirloom Farms' amazing yellow Lisianthus. It is so refreshing to see growers who actually appreciate the more unusual cut flowers or who have an eye for newer introductions. 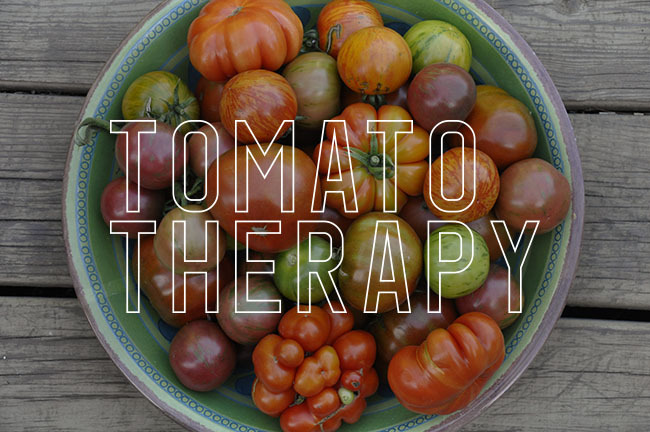 This grower raises their own plants from seed, and they also sell organic free range eggs. 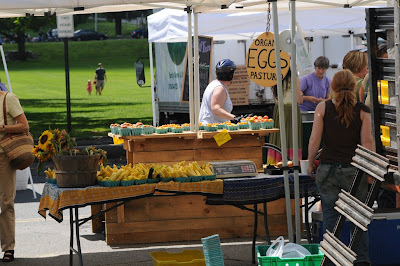 People arriving at the Amherst Farmers Market which runs on Saturdays, until 1:30 PM on the common. Event though we grow many of our own veggies, it's still nice to find options ( such as white baby turnips and Okra, this week). 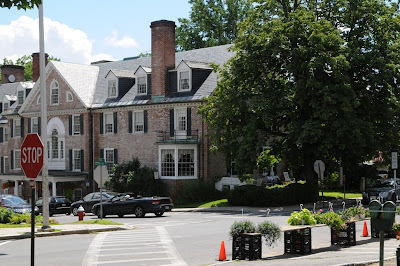 A street in Amherst, Massachusetts, a quintessential college town, with Amherst, College sharing the main center of town. 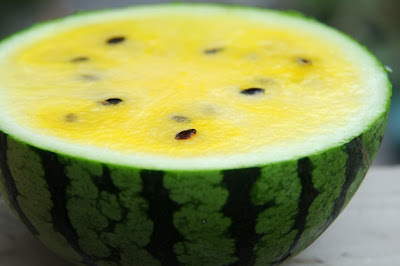 Yellow Watermelon, which was locally grown, has always been a treat for me ever since I was a lad exhibiting at the local Horticultural Society Summer Shows. 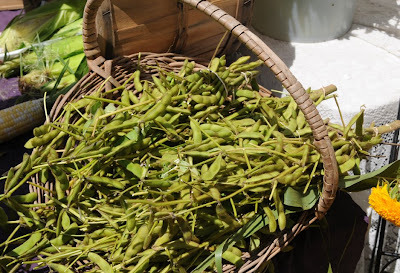 An elderly couple used to exhibit and win in most every class, during the summers, from sweet peas to beets. Their exhibits of summer-grown watermelons in pink, red, coral and yellows- all sliced in half for display on white porcelain plates, always captured my attention. I would stand in front of the display and imagine what the yellow crispy melon would taste like, I had seen nothing like them, ever. Now, I can buy them occasionally at the summer markets - what a treat. 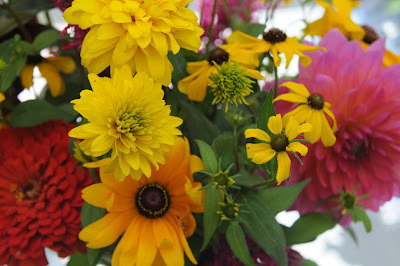 The more typical summer flower-fare, available at farmers markets - still, very nice and very August. 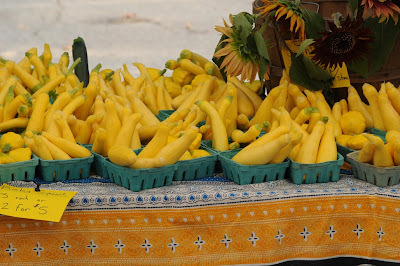 I love the summer squash variety called 'Zephyr', it's the one with the blossom-end tips which look as if they were dipped in green tea. 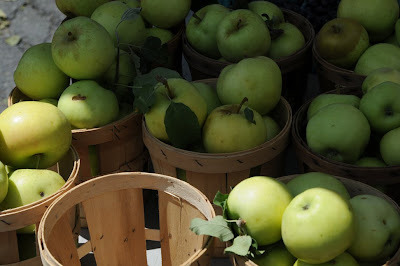 Early harvest of Ginger Crisp Apples. I had to get some of these. 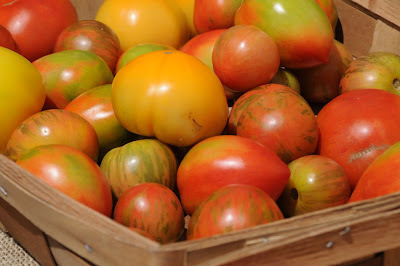 OF course, the omnipresent Heirloom Tomatoes. So what to make for dinner? With the purchase of some organic grass-fed ground beef, some Vermont Chedder, Goat Cheese, Sweet Corn, Baby White Turnips, and a fresh Ciabatta bread - I just opted on the carb-overload, since it was the weekend, and I could not decide which item should be refrigerated! 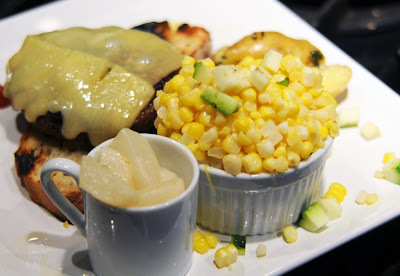 Here, a simple wood-grilled burger with chedder cheese, a cup of buttered baby white turnips , some sweet corn with French Sea Salt, goat cheese and butter, and a few Russian Fingerlings, all waxy and roased in virgin olive oil, an heirloom red garlic, and served with some fresh, chopped mint from the garden. On my last trip to Japan, I spent some time loading up my iPhone with entertainment for iTunes. 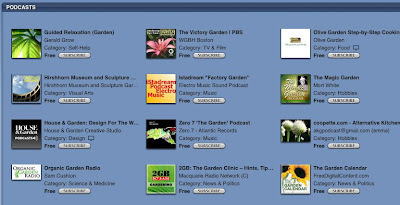 During online searches, I discovered the joy of the free uploads of many podcasts, and video. Podcasts are available for you to subscribe to, mostly free, from many sources, from lectures from the major universities such as Dartmouth or Yale on many subjects, including entire course lectures. This was a side of digital entertainment that I never new existed, for I am hardly a digi-geek. The simplicity of joining iTunes, and searching for my favorite subjects to listen to resulted in hundreds of blogs and lectures for me to download, far more than I could ever listen to on an 18 hour flight, but now, I am discovering the joy of burning these to a DVD or CD, to listen to in my car during my one hour commute to and from work. 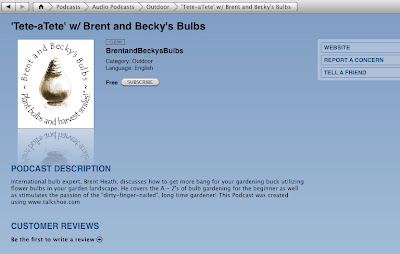 At last count, I saw over 200 podcasts about gardening, but there are plenty more if you search under such subject listings and plants, or orchids, or horticulture - all on iTunes, many of these, once selected, will have a dozen or more podcasts, each often an hour long. I only share this, since you may not be aware of these podcasts, and, some of them are extremely good ( others, not so good!, but it is fun to see for yourself). 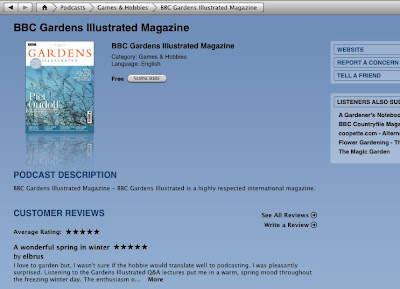 Imagine, last Saturday, while driving my 95 year old dad up to Kennebunkport Maine, we listened to Beth Chatto for two hours talk about Species tulips and her gravel garden, all downloaded for free from the podcasts made available on iTunes from the BBC Gardening Magazine. Videos, too are now available, to watch during lunch at work or on your iPhone, or other device, even while waiting in the car, if the kids are at soccer practice. I just downloaded a video podcast of the last lecture by Christopher Lloyd. 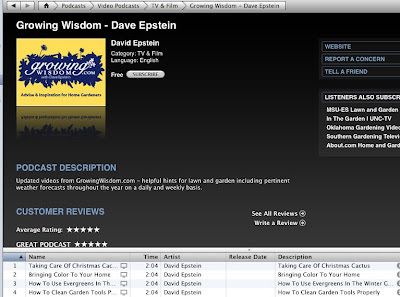 Our local TV weatherman at our ABC affiliate in Boston, Dave Epstein, is also a horticulturist, and now has a podcast available on iTunes. Expect experts, amateurs, maybe even me soon, with such podcasts. They are all fun, and informative in some way, but many are professional and very well done. 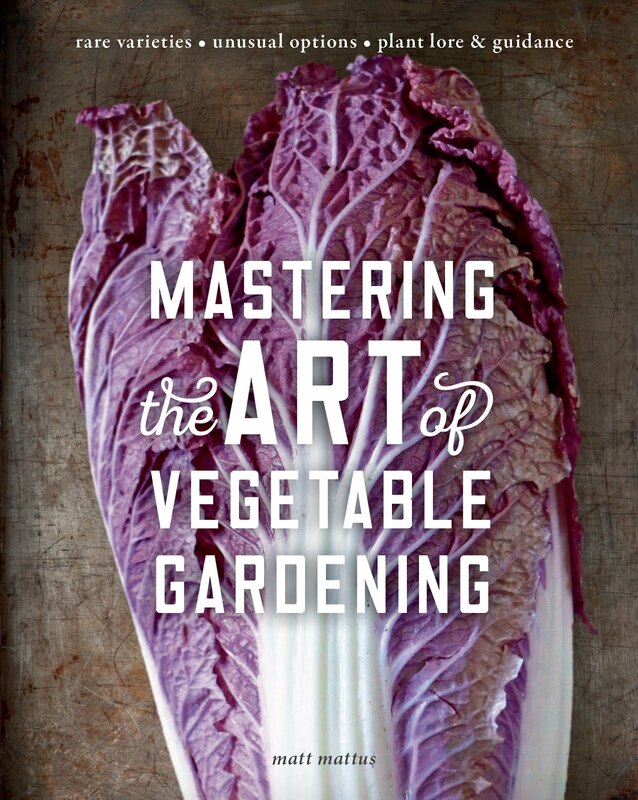 Look for the BBC Gardening series, Kew, The Missouri Botanical Garden, The New York Botanical Garden, Ken Druse's DIRT, and many more. 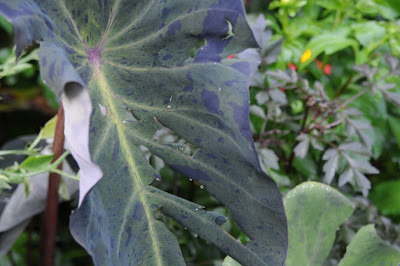 I avoided growing this cultivar, since firstly, I prefer species forms of plants, yet if I was truly honest, I like all plants, even the most gaudy of cultivars. So this year, instead of secretly admiring the neighbors 'Casablanca' lily's, I decided to plant a dozen. The bulbs are small, so it will take a few years for them to reach full size, but oh, the fragrance, and of course, the size. 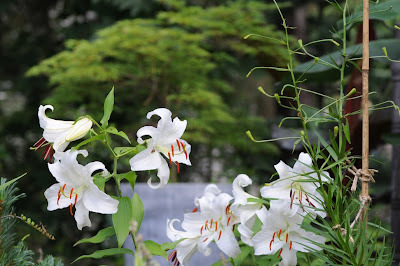 Besides all of that, they are filling a gap in both the lily world in our garden, and in the flower world. August can be quite flowerless, especially in perennial gardens. So here, in the front rock garden, where the lilies thrive in the raised soil, I planted masses of bulbs. Or, more accurately, a dozen of some cultivars. Ideally, I would like to plant 30 or more to get a good, awesome impression, so maybe this year, I will plant a dozen more. OK, now that I admitted my sins on gaudy plants, I ordered 60 Dahlia tubers this year. 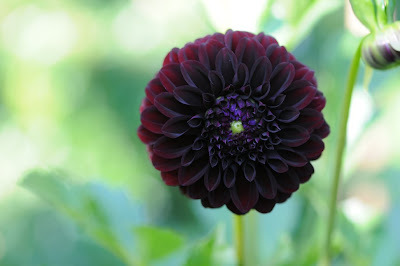 The first to bloom are the reddish form, for whatever reason, and I thought I would show this very blak-burgundy one since dark flowers are usually lost in the garden, but these I am growing for flower arrangements not garden color. So they are bedded out in rows in the vegetable garden. I limited my palette on dahlias, more on that in a later post this fall. 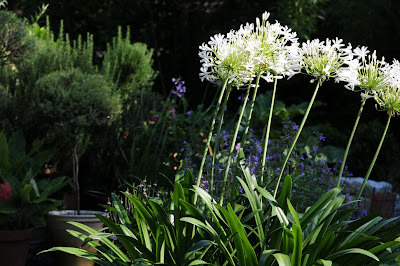 This giant form of Agapanthusm, the Blue Lily of the Nile, is a white cultivate, of which, we have never found the lablel for. Regardless, it is stunning, huge and always puts on a great show in August. This year, our two resident Ruby Throated Hummingbirds visit the blossoms in the evening, apparently when the nectar flows. Any guesses what this white flower is? II found this in the vegetable garden, and it at first, excited me until I realized what it was. 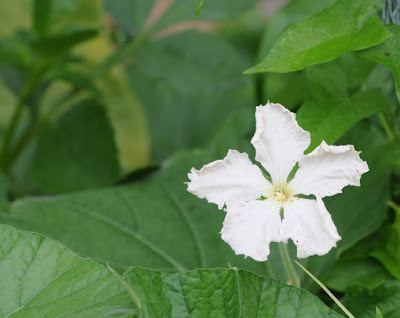 It is simply a blossom from a packet of Ornamental Gourds that I planted for nostalgias sake. The last time I grew gourds was when I was about 7 years old, in fact, that was the first thing I ever planted outside, when my parents let me have a corner of the vegetable garden to play in, horticulturally. In fact, this is growing in just about exactly the same spot too. This time, let's hope that I don't end up with a bushel of white, egg shaped gourds! Since, one tends to weed out all but a couple of vines! These white pickling cukes are different. 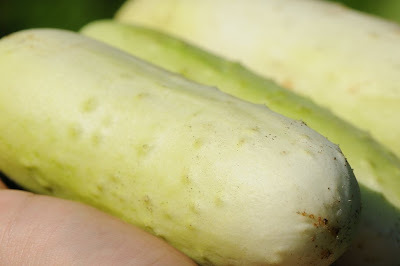 Cornell University has been breeding some new, white forms, and to be honest, I do not know where I received these seeds, but they are the only cukes that have survived, and I am loaded with delicious, white, pickling cukes!